Mike Vrooman made an impressive impact on local sports after coming to Simcoe in 1972 to teach at Elgin Avenue Public School. Soon after his arrival, Mike began playing and coaching hockey. He helped coach the Simcoe Jets, Rams and Storm. He was involved in the formation of the Simcoe Storm and served on the executive for many years. His hockey playing career ended a few years before his induction into the Hall. Mike was an avid golfer but a visual problem caused him to stop playing golf for a while in the mid 1980s. He returned to golf in 1998, the same year he was declared ‘legally blind’. It’s as a visually impaired golfer that Mike made his mark. In 2003 Mike joined Ontario Visually Impaired Golfers (OVIG). He was the OVIG senior men’s provincial champion in 2004 and in 2007. 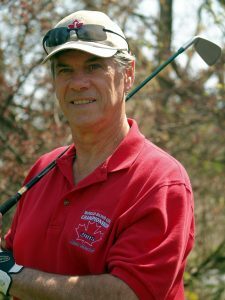 In 2006 he represented Ontario in the Canadian Blind Golf Championships in Quebec and in 2007 participated in the Nova Scotia Blind Golf Championships. Also in 2007, he was a member of Team North America in the Phoenix Cup Match Play held in Hamilton, Ontario as Team North America took on Team World. In 2008, he represented Canada in the British Blind Open Golf Championship and the World Blind Golf Championship in Belfast, Northern Ireland. He represented Ontario in the 2008 Canadian Open Blind Golf Championship in Cambridge, Ontario. With his coach/guide, Paul Davidson, Mike impressed everywhere he played. Although there were over 100 B2 golfers (less than 5% vision), Mike was, at the time of his induction into the Norfolk County Sports Hall of Recognition, ranked #15 in the world. Mike later turned his attention to curling and in his first bonspiel, his team finished third at the 2008 Ontario Blind Curling Championships in Hamilton. In 2009 Mike curled in the Canada Council of the Blind 5th annual Vision Impaired Curling Bonspiel in Ottawa. Mike, though, was more than an athlete. He helped found South Coast Special Needs Kids Inc in 1996 and served as its president for the next seven years. A meticulous organizer, Mike also helped plan and conduct many local and provincial golf tournaments. In 2007-2008, he became vice president of OVIG and was a member of the central planning committee for the 2008 Canadian Open Blind Golf Championship. He was also elected by OVIG to represent Ontario on the newly formed Canadian Blind Golf Association. Mike was much more than an athlete and organizer. He served as an example for others. His energy, his sense of humour, and his high level of skill were admired by many.